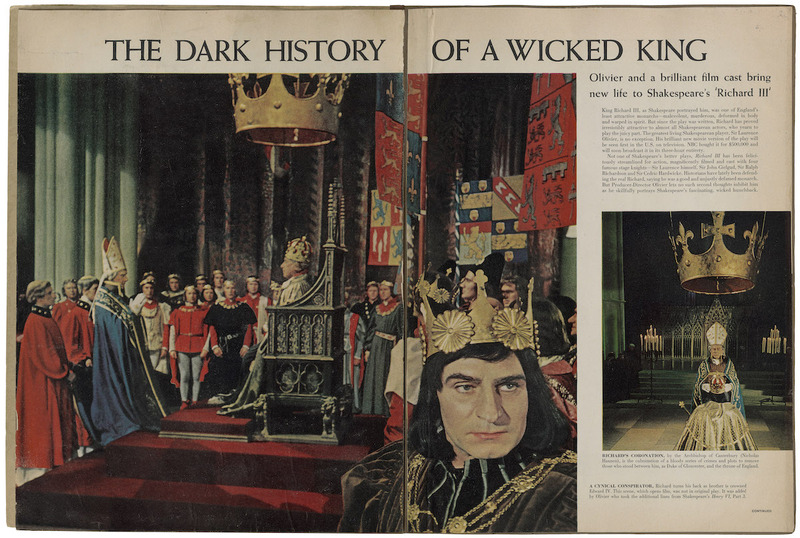 “The Dark History of a Wicked King,” Life magazine. Clipping in a scrapbook, circa 1956. Folger Shakespeare Library. Has any other film of a Shakespeare play left a greater cultural legacy than Laurence Olivier’s Richard III? Franco Zeffirelli’s Romeo and Juliet just celebrated its 50th anniversary and is timeless to its many fans, while Baz Luhrmann’s Romeo + Juliet has many supporters (and possibly even more detractors), but has either film been as widely imitated or inspired others as much? From Peter Sellers reciting the lyrics to the Beatles’ “A Hard Day’s Night” while dressed as and sounding like Olivier’s Richard, to Francis Urquhart and Frank Underwood in the British and American versions of House of Cards conspiring directly to the camera and charming the audience so that we become complicit in their villainy, both Shakespeare’s play and Olivier’s interpretation of it have left a larger-than-I-would-have-imagined cultural footprint. These thoughts occurred to me recently as I had occasion to watch Olivier’s 1955 film again, for the first time in probably over 15 years, and I was struck by how familiar it seemed. The opening trumpets, hand-painted credits (inspired by the medieval Book of the Hours), and shots of chanting monks reminded me instantly of Monty Python and the Holy Grail, which uses similar flourishes (but adds the hilarious business of the monks smacking themselves in the head with bits of wood that Shakespeare wishes he thought of). And Richard III’s wide-angle, brightly lit Technicolor production design looks like many Hollywood musicals of the period, most especially The Court Jester, which appears at first glance to have the exact same historical setting, arrived in US cinemas just six weeks ahead of Richard III, and starred Olivier’s friend Danny Kaye. Olivier’s interpretation of Richard is one he created for the Old Vic in 1944 and was famously modeled after the American theater director Jed Harris, who had directed Olivier in 1933 and who Olivier described as “the most loathsome man I ever met.” (Harris, in fact, also inspired another famous cinematic villain: the Big Bad Wolf in the Oscar-winning Walt Disney short The Three Little Pigs.) Olivier’s portrayal has the black page-boy haircut familiar to us from the known portraits of Richard, a majestically prominent fake nose, and a clipped nasal delivery that was instantly and widely parodied by many British comedians. Olivier also broke the fourth wall, addressing the camera and therefore the audience directly, which is quite common in the theater but a rarity at that point in film. The Court Jester was filmed after Richard III but released into US cinemas ahead of it, and while it’s unlikely the latter inspired the former, it’s amusing and slightly amazing to consider the timing of their releases and the similarities between the two films. Like Olivier, Kaye also directly addresses the camera in the opening scene (while name-checking Shakespeare) and confesses that the story that follows “starts as a scary tale”; both plots include kingdoms threatened by civil war attempting to use marriage to stabilize hostilities; and both films feature monarchs threatened by children with more legitimate claims to the throne. Notably, however, Olivier’s film focuses on a ruthlessly ambitious king and Kaye’s on a clever fool, and The Court Jester is quite pointedly a parody of such medieval swashbucklers as Michael Curtiz’s The Adventures of Robin Hood (1938), right down to the casting of Basil Rathbone, who spoofs his own performance in the earlier film (and proves, at age 63, he’s still a formidable swordsman). And Kaye’s performance, and his entire film — wonderfully — delight in language as rich and amusing and earnestly delivered as Shakespeare’s, especially in the famous “pellet with the poison” sequence. When Richard III premiered in the US in March 1956, it did so on the exact same day in both cinemas and on television, where an estimated 25 to 40 million people watched it for free, a number probably greater than all the people who’d seen the play onstage since its premiere in the late 16th century. Terry Gilliam, Monty Python’s lone American member and the co-director of Holy Grail, was 16 when the film was broadcast on NBC, and because he’s never once denied it (or indeed mentioned it at all), we can safely conclude he definitely saw the broadcast of Olivier’s Richard III and was forever inspired by it. Monty Python and the Holy Grail is filled with touches that echo specific moments in Olivier’s film. In addition to the chanting monks, the music in both films is heroic (Gilliam has called it “interesting…how traditional we wanted to be”); both films have characters directly addressing the camera; the Black Knight in Holy Grail who loses all his limbs but continues fighting is surely an exaggerated tribute to the merely crookback Richard, right down to the badge of a boar on his tabard; and Arthur himself, with his golden crown and chainmail and an actual sun on his tabard, brings “glorious summer” to the muddy mucky medieval winter. It also goes without saying that Arthur and his knights would surely have exchanged their kingdoms for horses but had to settle for banging two halves of coconuts together. Richard III is told, “Nay, good my lord, be not afraid of shadows,” which is excellent advice since Olivier’s depiction casts such a long one. (Is Alan Rickman’s look as Severus Snape in the Harry Potter films further homage to Olivier?) Olivier’s film was re-released in cinemas in 1966 and broke box office records around the world. When people think of Shakespeare’s character or even the actual king, it’s likely they picture Olivier in costume (unless they see Benedict Cumberbatch’s more recent portrayal from the excellent BBC series The Hollow Crown). The British Film Institute suggests Olivier’s Richard III may have done more to popularize Shakespeare than any other piece of work. This month is the 20th anniversary of the premiere of HBO’s The Sopranos and articles and interviews have talked about how without Tony Soprano, we might not have had such villainous TV protagonists as Vic Mackey in The Shield, Walter White in Breaking Bad, or Don Draper in Mad Men. But these characters can be traced directly through Olivier’s charming and compelling performance back to Shakespeare himself, who created the original and enduring prototype for the contemporary anti-hero over four hundred years ago. Perhaps the most delightful association was revealed by several of the Folger’s followers on Instagram (notably @gennithvieve, @and.thats.the.teana, and @mperez27) who pointed out that the villainous Lord Farquaad from Shrek is a dead-ringer for Olivier’s Richard. It’s a wonderful bit of cultural appropriation in that Shrek is also the story of a man who must marry to secure a throne and, in that he’s so vertically challenged he too feels, like Richard does, that he is “scarce half made up.” (I think there’s an ogre in there, too.) Farquaad was also played by John Lithgow, an actor who had the ultimate Shakespearean upbringing as the son of the artistic director of Antioch Shakespeare Festival (which he talks about here on the Shakespeare Unlimited podcast), so the Richard III connection would not have been lost on him. Very fun read. I’d never heard of the “The Court Jester” before now; I ended-up playing a bunch of clips from the film (via YouTube) for my kids tonight (ages 7 and 9) to delight all around! Can’t wait to see the whole thing. As much as I love Olivier, Richard III the play, and Richard III the King, I can’t agree that Olivier’s 1955 film had a greater cultural impact that Zeffirelli’s Romeo and Juliet. I’ll never forget when I first saw Zeffirelli’s film with my 9th grade class. Romeo and Juliet was our introduction to Shakespeare, and viewing the Zeffirelli film was our reward for surviving our first foray into Early Modern English in iambic pentameter. The Zeffirelli film was used in 9th-grade classrooms throughout the U.S. for my entire generation. I used it with my students when I became an English teacher; it’s simply the seminal, most ubiquitous version of the play. Since Romeo and Juliet is a fairly standard part of the curriculum in this country, I believe there are very few people in my generation onward who have not seen Zeffirelli’s film. In contrast, I did not see Olivier’s Richard III until well into adulthood. I’m afraid most people in my generation and onward are not familiar with it at all. I do realize you are considering the artistic influences of Olivier’s production on filmmakers that followed, rather than focusing solely on the quantity of viewers. I’m not a film expert, so I can’t really speak to that angle, except to one small point you made about Olivier’s choice to have Richard speak directly to the audience. This may have been unusual for a film at the time, but it is, in fact, a stage direction for the play (called an “aside”). Olivier was simply staying true to the source material in this example. So glad! THE COURT JESTER was a staple in our house when our kids were little, too…as was, interestingly, then they got to be young teens, Branagh’s HENRY V.